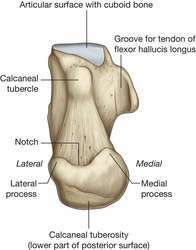 The origin of the muscle was in the superior third of the anterior fascia of the soleus muscle and the insertion, was attached with separate tendon, in the anteromedial surface of calcaneus bone. Finally, calcaneus bone Pb exposure was categorized into quartiles based on the exposure of the control group as follows: first (0-11. Serum bone alkaline phosphatase and calcaneus bone density predict fractures: a prospective study.